Former Mayor Edward I. Koch, the 105th Mayor of the City of New York, was honored recently at a signing ceremony attended by Mayor Bloomberg, City Council Speaker Christine C. Quinn and many Council Members and other dignitaries formally renaming the Queensboro Bridge as the “Ed Koch Queensboro Bridge”. 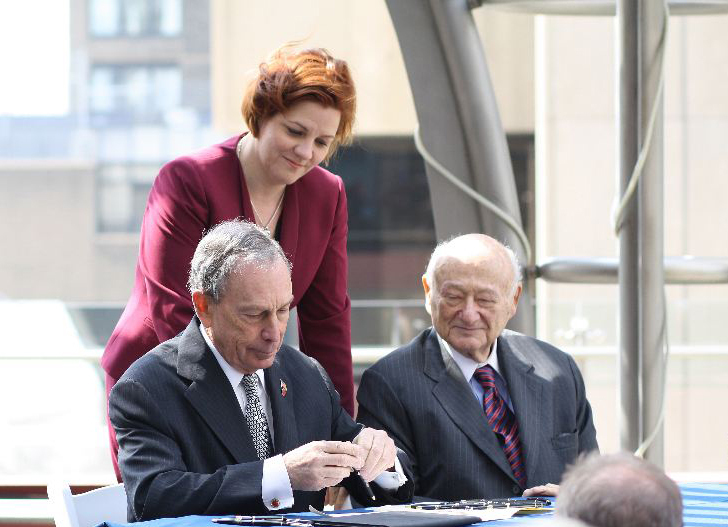 “I’m truly overwhelmed by the honor and very grateful to Mayor Bloomberg, Speaker Quinn and to the members of the City Council for having made it possible – my deepest thanks,” said Mayor Koch. When Mayor Koch assumed office, much of the City’s infrastructure including the Queensboro Bridge had reached near-critical condition. The disastrous financial situation facing the City and the fact that there was no capital program in place to repair key transportation infrastructure spurred Koch to restart such a program to rebuild much of the transportation infrastructure. Much of the bridge had not even been inspected in nearly a decade. The City’s East River bridges, including the Queensboro Bridge, had been turned over the New York State for stewardship, as the City was no longer able to maintain the structures. Under Mayor Koch, the City regained control of the bridges and began repairing them. Mayor Koch created the Bureau of Bridges within the Department of Transportation and fully funded the bureau. Koch and his administration have been credited for the turnaround of New York City. Jim Capalino was Mayor Koch’s Commissioner of General Services and was a key player in the progress made during the Koch years. He was the youngest Commissioner in New York City’s history (at 28) a record that still stands. Mr. Capalino is a life long friend of Mayor Koch and remains a true admirer of his many accomplishments, including his latest efforts with New York Uprising to create a non partisan redistricting effort for New York State.